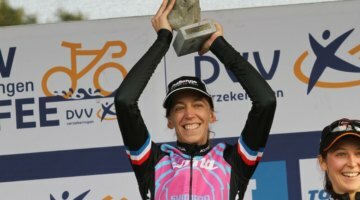 At a serpentine Superprestige Hoogstraten, Sanne Cant (IKO Beobank) continued her post-Worlds parade of her second rainbow jersey. The Belgian showed she’s not afraid of taking an early lead, and forced the issue early on the muddy course. 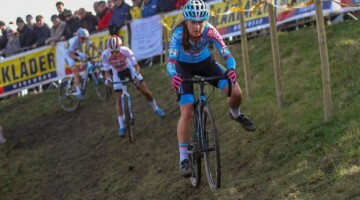 For the second day in a row, Maud Kaptheijns (Crelan Charles) was Cant’s main challenger, but she made several bobbles in the mud and got caught up in the course tape. 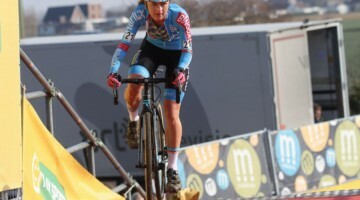 Helen Wyman (Xypex – Verge) completed the podium, 34 seconds back. With Cant’s win, she now holds a narrow one-point lead over Kaptheijns with just one race remaining. 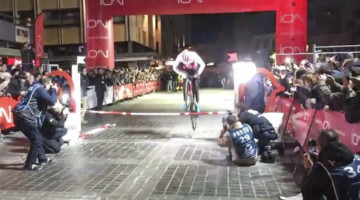 Three Americans took the start, with Elle Anderson (Milwaukee – Alpha Motorhomes) finished ninth, Rebecca Fahringer (NoTubes) finished in 21st, with Corey Coogan Cisek (PowerFixCX) in 34th.